Yes, you can actually make money online by posting the selfies you take every day. With such an opportunity, now the frequent selfie takers won't be mocked as self centered but rather the trend would be seen as profitable. Just like how a teen Pakistani recently became the youngest e-gamer to become a millionaire. I'm sure many parents would see this as an opportunity and would rather even say: 'Beta why don't you go ahead an play dota 2! There is quite some money in it' LOL. A popular platform, named 'Stylinity' lets users post their selfies, photo shots or just random photos they take. Anyone on the platform can then buy the images if they wish to use them in their projects or anywhere they like. What's great about the platform is that it makes it pretty easy to upload and share your selfies to social media to get the viral aspect kicking in. By going to Stylinity.com, you can register your self and start uploading your photos. There are over 150 international brands on the platform that you can associate your self with. Once you make the account, you can then either than upload your own selfies and photos, or browse other images and shop them. There are tons of professional images out there in their marketplace that will give you ideas too! Though as with every field online that lets you make money, I don't see it would be any easy to make a decent money out of the platform. This is because of the effort you're suppose to put in to rise the charts. The platform already has such professional looking photos that you can't just take your smart phone and point and shoot and then expect to make a decent money out of it. You must have a professional camera or alt east if you're looking forward to utilize your smartphone, then it must be one of those high end smartphones. Stylinity also have their complementary and fully functional mobile applications for iPhone and Android phones which make it more easy to upload the selfies. Well, at this point I won't say Stylinity is for every body as it's a new phenomenon and it will only take quite sometime for the platform too rise! More on it: How it works? In many US based retail stores, you'd find Stylinity small stages that would have a huge 6 feet tall stand where you can place your own smart phone in the holder. You could then use the mobile app to take a selfie of you with your new clothes that you bought. 2- You take a selfie with your phone, of your self using a stage on the retail stores (Mostly only in US now). 3- You could then share the pictures publicly (or with only specific people). Your pictures would be linked to the product's website that you bought. This way, when someone makes finds out your image on Stylinity marketplace, and buys a product through your selfie, you get paid for it! 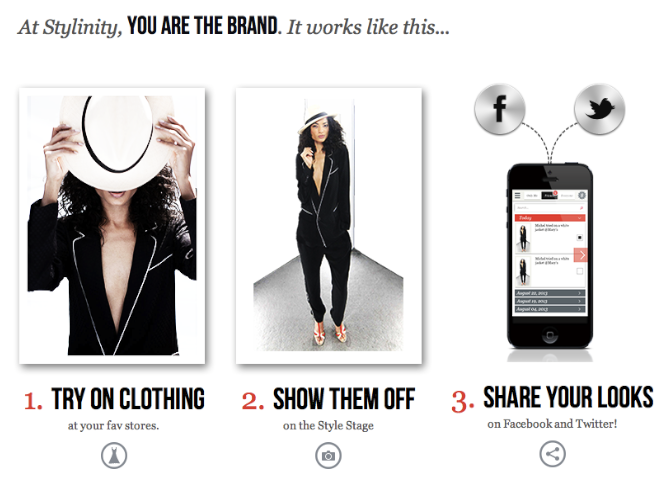 How cool would that be if stylinity would be available in world wide retail stores. If you don't have such selfie stages in your country yet, as it's not available in Pakistan yet and many other Asian countries, you could upload your images through the website/mobile app and link them to a website link of the product you were wearning. Again, when someone makes a purchase through your link, you get paid! Stylinity for now pays via PayPal. Once you get to make sales, you earn a commission out of the purchase other makes via your link. Then, finally you get redeem your points about 4-5 times a month! There is more detail on this on their website. What I'm Getting To Love About This Idea? Well there are a lot of people who love sharing what they wear and their style statement. Stylinity is specially for these people who could not only share what they wear, BUT can make money out of them. It's definitely a nice idea and I could see it rising pretty fast. Not that it's a get rich fast scheme, though it's a unique platform that was worth sharing with you guys. How Much Money Can You Earn With 1000 Visitors Per Day Using Google AdSense? How To Earn $100-200 Per Month From Internet?